Amar Chitra Katha has forayed into the digital world by launching official digital store app for across platforms — Windows 8, iOS and Android. Dubbed as ACK Comics, the store will offer more than 300 titles on personalities such as Akbar, Chanakya, Jawaharlal Nehru and JRD Tata to users. Available for free, app has been developed by App9 Digital Studio, the digital division of Ninestars Information Technologies Pvt. Ltd.
said Manas Mohan COO Amar Chitra Katha. The digital comic is available in a flip-book mode as well as panel-by-panel mode which is convenient for smaller devices. Users can download and read their comics on multiple devices using a single user account. The books will be available for download at about 99 cents on the iOS platform and a similar rate on the Android platform. 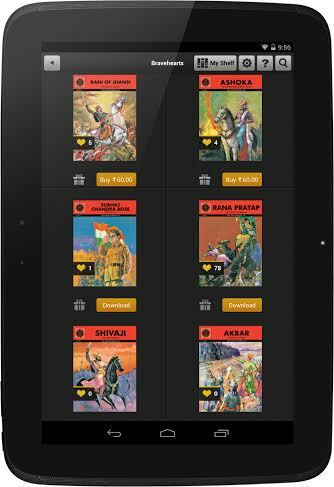 Amar Chitra Katha is one of India’s oldest and most loved comic series.